MUNICH -- General Motors' Chevrolet brand kept its No.1 spot among foreign brands in Russia in 2008 despite a growing challenge from Hyundai. Chevrolet increased its sales by 24 percent to 235,466 cars last year compared with 2007, according to figures from the Moscow-based Association of European Businesses (AEB). Marc Kempe, spokesman for GM in eastern Europe, said Chevrolet was benefiting from a wide range of products and its fast growing dealer network. He said: "Chevrolet in Russia has a broader range of products than anywhere else in Europe. It has the European cars, but also has other cars such as the Chevrolet Niva SUV." Russians also liked the value positioning of Chevrolet, Kempe said. Sales of foreign brands increased 26 percent to 2.08 million in Russia in 2008, according to the AEB. But nearly all overseas brands suffered a tough December, with sales down 10 percent to 159,711. CSM Worldwide forecasts the Russian market to fall 11.4 percent to 2.47 million in 2009 before recovering to 2.49 million in 2010. Hyundai fell short of its aim to sell 200,000 units in Russia in 2008, but it was Russia¹s second best-selling brand after its new-car sales increased 30 percent to 192,719. Toyota was the No.3 foreign brand with its unit sales up 31 percent to 189,966. Ford dropped to No. 4 from the No. 2 spot in 2007 despite increasing its sales by 6 percent to 186,828. 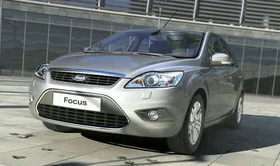 The Ford Focus held the top spot as the top selling foreign car although its sales fell 4 percent to 93,496. Nissan was the fifth largest foreign brand with sales up 26 percent to 146,547. Last year, GM increased its production capacity in Russia with the addition of a 50,000 semi-knocked down factory at the Avtotor factory in Kaliningrad and the opening of a factory in St Petersburg. Chevrolet is confident about its prospects this year despite expectations the Russian market will get tougher. Said Kempe: "We are well positioned with our manufacturing footprint and brand portfolio. We are quietly confident about 2009 in Russia."